The first game of international was played between USA and Canada in 1844. This might be pretty strange considering the fact that this two nations have almost no cricket culture in the 21st century. But the game has got its own History in other parts of the world like Australia, India, Pakistan, England etc. Now, every game has got a few legends. Cricket is also one of those few games in which these legends helped the game become more popular among the masses. When we are talking of legends we typically group them under the great batsman category or bowler’s category who played for different countries. Australia had some of the great batsman like Bradman, Ponting, Michael Clarke etc. India had legends like Gavaskar, Tendulkar, Kapil Dev etc. The legends made the game what it is today for the fans and every fan followed a particular player. When these players had such kind of fan following then obviously there is going to be a comparison among the players. But can you compare two great players who played during different times, different playing conditions and against different set of opposition? That is the real question. Fans get tempted to underestimate the achievements of players about whom they don’t have much knowledge. Also about the players whom they dislike the most even if they were great. The definition of greatness is subjective. One player might be great for person A but it may not be for person B. Many great players have tried to analyze the game played by cricketers during their tenure so that they can reach to some conclusion about greatness of players. But many of them have failed to do so. Some have tried to make the job easier by comparing the players who played during the same period. That move is sensible because the game has changed a lot from what it was played earlier. Now it is more batsman friendly which it was not during earlier times. Also the rules of the game have changed substantially over a period of time. So comparing Tendulkar with Ponting is more sensible than comparing Tendulkar with Bradman. Since both Tendulkar and Ponting played during the same time when the pitch conditions were similar, bowlers were of the same quality and rules of the game were same. Comparing players who played during two different time periods is like comparing apples and oranges. You cannot underestimate the achievement of one player just because he made less centuries or had lesser batting average. Bradman played under similar conditions in Australia and England. 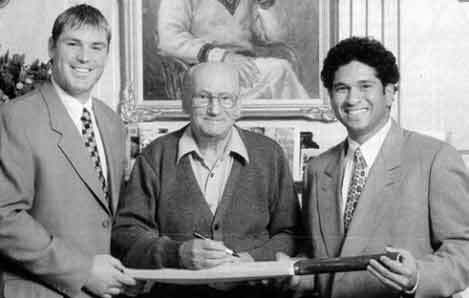 Tendulkar played in Africa, Europe, Australasia, North America and subcontinent. But Tendulkar didn’t play when bowlers used to adopt bodyline technique. Similarly a bowler who bowled during 80’s or 90’s cannot be compared to a bowler who bowled during 50’s and 60’s. Both bowled to different set of players and also the role of technology was limited during earlier period. All the legends who played during different times are great. They adapted to the playing conditions and outplayed the opposition consistently. They set a benchmark for other players. That’s why they are always remembered.